Markets under bear hug. Investor wealth slumped by Rs 1.92 lakh crore as the Sensex plummeted by 563 points following heavy selling in global stocks ahead of the US jobs data. Mumbai : Investor wealth slumped by Rs 1.92 lakh crore as the Sensex plummeted by 563 points following heavy selling in global stocks ahead of the US jobs data. The Sensex plunged 562.88 points to settle at 25,201.90. Friday's closing was the lowest level since July 14, 2014 when the index had closed at 25,006.98. Following the sharp decline in stocks, the market capitalisation of BSE-listed companies fell by Rs 1,92,604.36 crore to Rs 93,83,643 crore. The stock markets crashed over 2 per cent on Friday to close at one-year low. The fall is attributed to continuous global worries such as Fed rate hike etc. 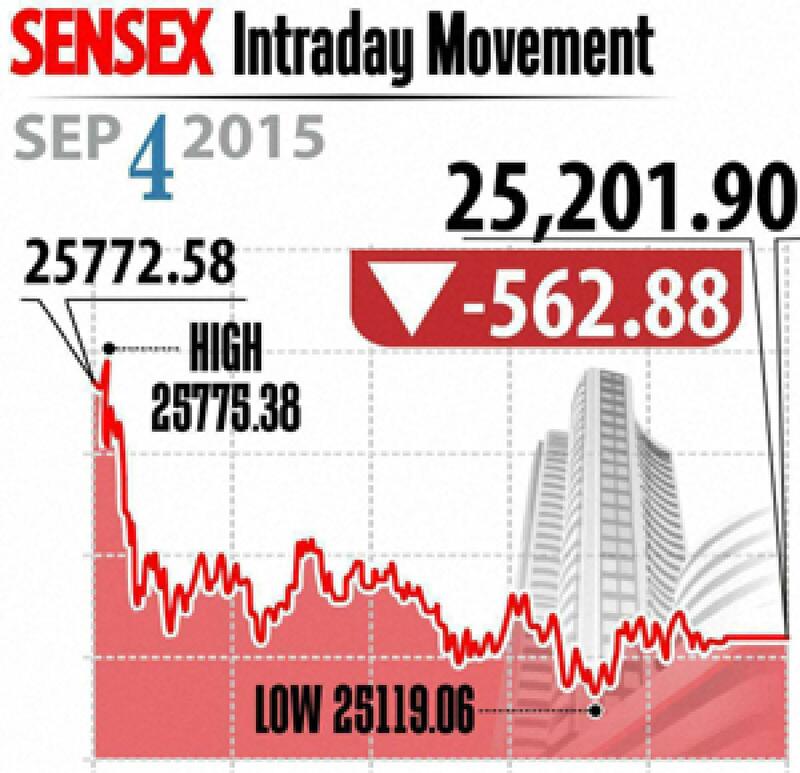 Sensex closed 563 points lower at 25,202 and Nifty ended 168 points down at 7,655. The broader markets also suffered selling pressure with midcap and smallcap ended lower up to 2.5 per cent each. Analysts opined that the domestic cues also added to the fears of the investors who expect lowering of agri output due to deficit rains. Further, there is no trigger to take market higher. In fact, the market is getting support consistently from domestic institutions such as mutual funds, insurance and pension funds. Meanwhile, the FIIs sold Rs 1,280 crore worth of shares taking the told selling to about Rs 4,000 crore. On sectoral front, all the sectors ended in red with bankex, power and realty the top losers up to 3 per cent each and others followed. From banking segment, HDFC, ICICI Bank, HDFC Bank, Axis Bank and SBI closed down up to 3.5 per cent each. While pharma pack witnessed selling pressure with Sun Pharma and Dr Reddy's down over 3 per cent, Lupin closed flat. IT majors Infosys, Wipro and TCS closed down over 2 per cent as the investors preferred profit taking ahead of US job data. The gainers: Bharti Airtel, up 0.75 per cent at Rs 349.85 and Coal India, up 0.32 per cent at Rs 346.75. The losers: Vedanta, down 4.84 per cent at Rs 93.30; Gail, down 4.73 per cent at Rs 280.90, Tata Steel, down 4.66 per cent at Rs 218.95, Hindalco Industries, down 4.34 per cent at Rs 73.85 and Axis Bank, down 3.61 per cent at Rs 468.85.